Donald Trump is much more than an unconventional President and populist politician – he represents the growing conservative uprising that the United States in undergoing. Our nation rebelled against progressivism in an extremely decisive way back in November 2016, telling the world that we no longer wished to live under the thumb of career criminals such as Hillary Clinton and her delusional democratic deities. Furthermore, Americans were ready to drain the swamp, and bring in a Commander in Chief whose independent wealth makes him nigh impervious to the cancerous scourge of special interest groups that are sickening the American political system. This return to the traditional American view of the world comes with it a sense of freedom to express yourself, as it is written for us in The Constitution. This includes religious freedom – something that the left had attempted to stifle in recent years through the use of weaponized political correctness and an assault on the First Amendment. Now, as Americans return to saying “Merry Christmas” without shame or guilt, the President is proud to have been a part of this homecoming for one of America’s most celebrated holidays. “When he ran for the White House in 2016, Donald Trump promised to make America great again. “Late Sunday night, on what appeared to be a busy Christmas Eve at his Mar-a-Lago estate in Florida, the president took a bow for what he views as his successful role in making Christmas merry again. Trump had predicted this moment back on the campaign trail as well, merely a month before his election. 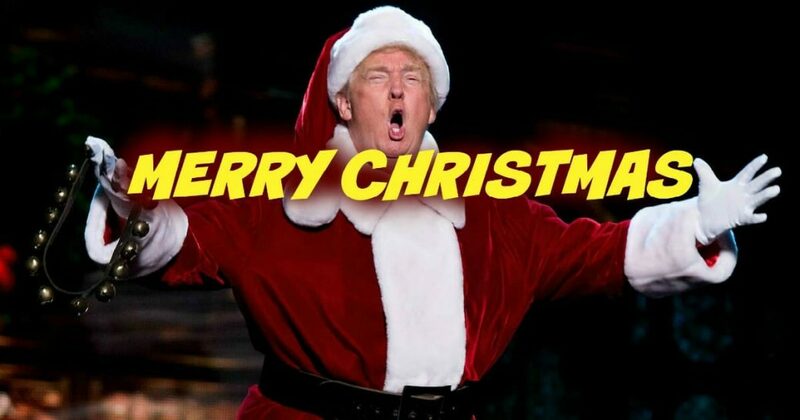 The republican candidate, in what may very well have been an improvised moment, told the nation that we’d be “saying Merry Christmas” again if he were elected. As it turns out, he was completely correct. And with that, we say to you, dear reader, have yourself the merriest of Christmases today. The Schumer Obstruction CompanyUFOs Over Canada a Threat to America?